It was good to talk to you guys. I was a little down that night, we were tired, hot, and weary but I am glad we were only stuck in Dallas for one day. At the airport we were a little bored, but we were able to talk to some great people about life and the gospel of Jesus Christ. We also meet a lot of Brazilian members that were flying down to São Paulo and were able to understand a little and talk a little to them. We were soon on the 9 and a half hour flight, I was sitting with a Brazilian and spoke a little too. I told him I was a missionary for the church but it was hard understanding him and talking with him. Then we made it to the airport and went through customs and I exchanged my money for 16 Reals. We then got on a bus to the CTM/MTC in São Paulo. I was hot, I was sticky and I needed to shave but we were all so happy to finally be in Brazil. The food here is wonderful, different some times, but wonderful. The rice and beans is served in every meal and it is really tasty. For Breakfast we eat paninees, grilled ham and cheese sandwiches. The Guadana is wonderful and it doesn’t really taste like the ginger ale and apple cider mix we had with the Crumps, but it is good. The Learning and teaching here is different, it is wonderful to be able to speak the language with any Brazilian and they are very nice. They are a bit crazy and full of energy but great people. We also have one Brazilian in our room with his companion from Peru who is learning Portuguese. It is cool to see many Argentinians here as well. There is an Elder Lopez that says he remembers you, but he was speaking in Portuguese at the time so I don´t know for sure. We are learning a lot more grammar but also focusing on getting to know investigators and teaching to that need. It is hard sometimes with the different situations that we have, it really teaches us to rely on the spirit and also know how to teach to answer their questions. Wednesday is my P-day. On P-Days we get to go to the temple, it is beautiful and a wonderful time to learn and be edified. Also we get to go out and shop look around and talk with people. The ties down here are very cheap 15 reais for 2 ties or 4-6 bucks a tie. I got to go but this gospel is true and the work is real and wonderful. DO NOT SEND PACKAGES to the Brazil Missionary Training Center. All packages must be sent directly to the mission where your missionary will be serving not the MTC. If you have already mailed a package to the Brazil MTC and it arrives after your missionary has left for the field, please understand that the package cannot be forwarded to his or her mission and will be returned to you. The only other option is for us to open the package and forward the letters and photographs, giving the rest of the content of the package to the missionaries that are here. This has been a great week but also a little crazy. On Saturday my companion Elder Peterson went home to get surgery on his knee, and on Tuesday 5 Elders in our district went to the Brazil MTC leaving just four Elders this week, Elder Dimond my new companion, Elder Buchanan, Elder Clay and myself Elder Sands. Also on Tuesday night we had the great blessing of hearing from Elder Rasband. He talked about the great gift of the Holy Ghost and how to always have it with you. I learned that when we listen, and then do what the spirit directs then we will be lead to who the Lord has prepared, and that he can count on me to fulfill this great responsibility. Then on Thursday we got our visas. 3 of us anyways, poor Elder Dimond is still waiting for his visa and is the only one left in our district. We are praying he will get his soon. I will be leaving to Sao Paulo on Tuesday the 19. I will try and call you at 7-7:30 Texas time. Today, Friday I had the wonderful blessing to go to the Provo Temple, what a wonderful experience, and it is much bigger than the Spokane temple, I almost got lost in it if it weren’t for my companion steering me in the right direction. We even saw our teacher Irmao Canan on his day off in the temple, that was really exciting. The Provo MTC has taught me many things, patience, charity for everyone, kindness, studying by the spirit, and trusting the Lord to help me out. Also during our last TRC, when we taught, the lesson was everywhere by we knew we were being directed by the spirit, and that let us know we are doing the right thing. This is the true gospel of Jesus Cristo and was restored on the earth again by Joseph Smith the prophet, the Book of Mormon is the word of God and I invite all who read this to read it and pray to know if it is true, if you do not have a copy two missionaries will be happy to take one to you. Thomas S. Monson is the living prophet on the earth today. And Jesus Christ is my savior and the savior of all mankind and we need to follow his example and have faith in him, repent of our sins, be baptized with one who has the authority, receive the gift of the Holy Ghost and heed it's promptings, and endure to the end. I will next write from the Brazil MTC! It is Elder Sands, sorry you haven't heard from me in a little while, but because of General Conference we did not get a P-day last week. This past week and a half has been wonderful. 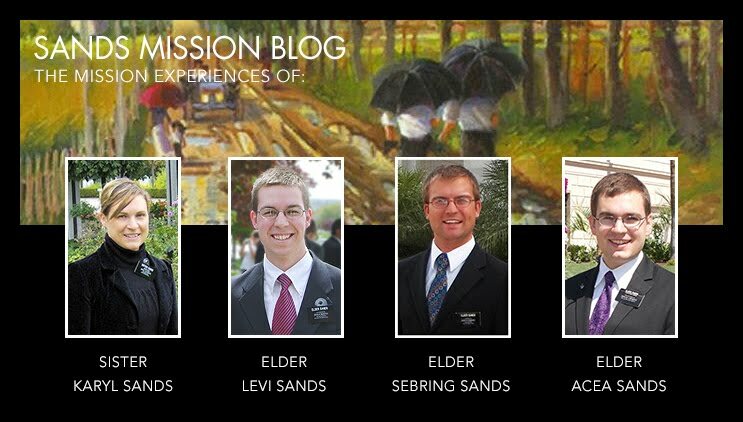 I got here and really couldn't believe I am here at the Missionary training center. I meet my district and almost all of them are going to Campinas. The days are made with studying, class time, and more studying, which isn't so bad because you have the spirit of learning that is very hard to get with all of the distractions in the outside world. The language is going great, the first day our teacher Irmao (brother) Slater only spoke in Portuguese, it was difficult at first, but because we have been trying our best to speak the language all the time the lord is blessing us for our efforts with the gift of tongues. General Conference was wonderful, I loved Sister Stevans talk about how we need to be more like children found in Mosiah 3:19, I made it a goal to be more humble, patient, full of love, and willing to submit my will to the lords. My companion Elder Peterson is wonderful, he is an elder with few words, but I am learning mountains from him, it humility, brotherly love, and patience. I need to tell you what is going on with us. He has been recovering from an ACL tear for 4 mouths and unfortunately he re torn it on the second day hear. After spending hours in the doctor’s office he has torn his ACL, MCL and his meniscus. He is leaving tomorrow to get surgery on it, and hopefully in 3 mouths he will be here again. I am very sad but will pull through. Five elders in my district have their visas but not me and they leave Tuesday. I will be praying for it and hope it will come soon. I have been able to talk with Elder Lee a bit and he also got his visa and is leaving Tuesday. So I will have to see what will happen. I am learning much and doing much; on our first TRC contacting in Portuguese it was rough the first time but got better by the third time. And we taught with the spirit and testified of the truthfulness of this gospel and we looked into their eyes and watched how the spirit was working on them, even though they were just volunteers. It is great to hear from you and thank you for the letters, for right now just dear elder me because we only have 30 minutes and it is not that much time. Thank you much I love you and will be out here for two years in service to the Lord.